The bulk of our industrial noise control clients are unable to build full or partial enclosures around their noisy machines. Sound barrier blanket systems that would otherwise block the noise from spreading throughout their facility cannot be used. They would be interrupting the process that’s being performed, or the noise source is not stationary. 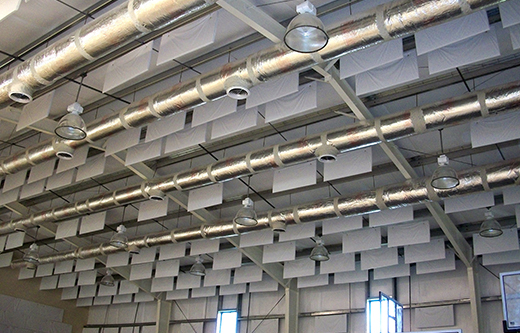 Beyond that, the use of the same sound barrier blankets to serve as perimeter curtain systems to house the noise to a more contained area of the plant are also deemed impractical due to the layout of their facility. This is Step #3 in your quest to control Industrial Noise. The only recourse at that point, is to lower the exposure levels of the noise in the plant by capturing and converting the echoes in the space that are spiking the decibel levels. Industrial noise levels peak when both the original sound and the reflected sound combine to spike the decibel level readings. If you are on this page of our website, it tells us that you cannot use the QBS Blankets to deaden the noise at the source, and that the only recourse is to work to limit the impact the noise is making as it reflects around your room’s perimeter. 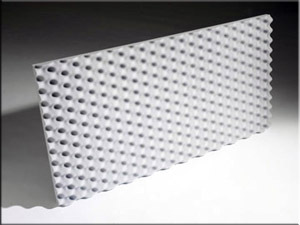 A series of acoustic absorbing panels can be placed into your work space, wall or ceiling mounted, to capture and convert the echoes from your plant. Capturing echoes can trigger 5-10 dB drops, while QBS Blankets can trigger 12-20 dB drops. Results will vary per application, the point here is that controlling noise at the source is a better value back than controlling noise along the path it is reflecting. Capture the Echoes. Slow the Noise. Sound panels can be placed into the wall or ceiling of your facility to help capture and convert the unwelcome echoes from your plant. By lowering the level of sound wave reflections inside your space, you lower your level of background noise and generate greater protection for your employees. 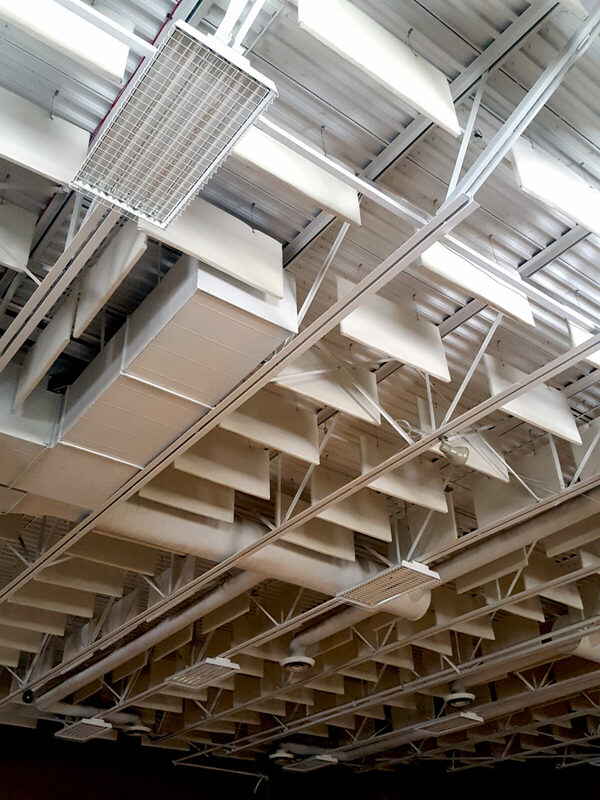 For ceiling mounted treatments, the VET Baffles are the most popular item we sell. These are class A fire rated sound panels that suspend vertically spread throughout the expanse of your ceiling as shown in this image. They will combine to help slow the reflected echoes in your room and better control your decibel level exposure. In addition to, or instead of, the VET Baffles from your ceiling, there are wall mounted options that can further contribute to your ability to control unwelcome echoes inside your plant. 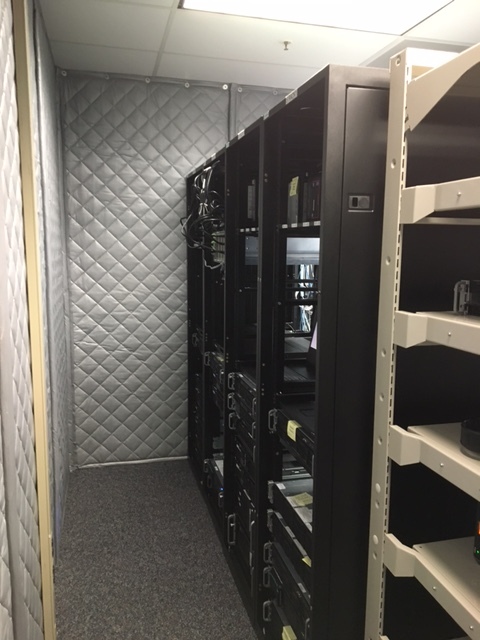 FireFlex sound panels are class A fire rated sound absorption panels that can ship to your project site in 2’x4′ panels and be easily glued to your perimeter wall surface. Also, the QB Sound Absorbing Blankets can be cut up to 25′ tall and suspended from your walls to capture and convert the echoes from your space. Note the QB blankets absorb echoes only, while the QBS blankets serve to block directional noise. To recap the industrial noise control step through process, Goal #1 should be to kill the noise at the source by using our QBS Blankets to deaden directional sound. Goal #2 should be to back away from the unit, and use the same QBS Blankets as a dividing sound barrier curtain that can separate your noise from the rest of your plant. Goal #3 should then be to lower the ambient echoes in the room by introducing sound panels to your perimeter wall or ceiling inside the room. The use of QBS Blankets can trigger average 12-20 dB drops, while the use of sound panels only would trigger average 3-8 dB drops. The combination of strategies would trigger the most aggressive overall levels of noise absorption and reduction. Also note! 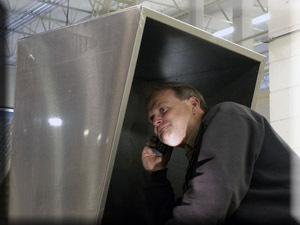 Our popular AcoustiBooth phone stations can be placed into your plant for clarity to telephone communication in loud industrial environments. Defeat the noise at the source. Eliminate its ability to spread. Back away from the machine, treat the perimeter space with a sound barrier wall, protect against the spread of noise. Wall or ceiling mounted sound panels will deaden the echoes and help reduce your exposure levels. A variety of acoustic projects are rotated through our Case Studies library. We invite you to review the variety of soundproofing treatments that we post there and continue to update. 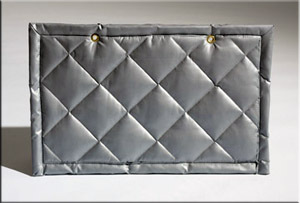 VET Baffles are the most popular form of sound panel that we sell. For less than $3 per square foot, it is the most cost effective product treatment in our mix. The baffles tuck up and out of the way inside your plant. 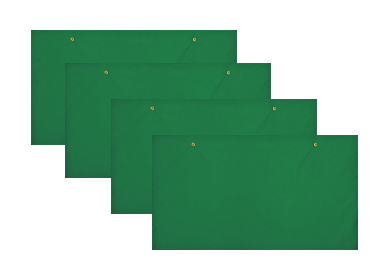 They are class A fire rated, waterproof, and available in 25 colors. The key to the success of your project lies not in where you place them, but in how many you introduce into your room. To calculate that number, use the Room Analysis tool at the bottom of this page. Use this tool to feed us the dimensions of your plant. In turn, we will reach back with some answers including panel choice, quantities and price points. Questions? Call our help desk at 1-800-638-9355. NetWell’s Room Analysis Worksheet is designed to help equip you with the numbers you need to carry our conversation forward and deliver the sound values back that you are seeking. The size, shape and surface textures of your space will help our team define our strategy and build the framework for your upcoming treatment.